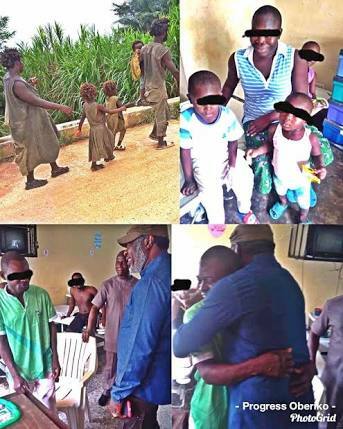 Here's the family of five who went viral after their condition (madness) was brought to the notice of the public by a former National Youth Service Corps (NYSC) member, Progress Oberiko. The family of Mr. & Mrs. Ben Ogar were rescued some weeks ago following weeks of intense search by a team from the Cross River State Government and Federal Neuro Psychiatric hospital, Calabar, Cross River State. The wife has revealed details of what happened to them. 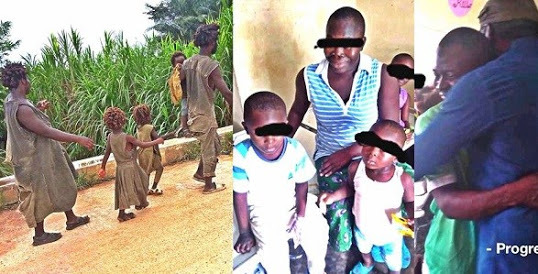 She said her husband lost his means of livelihood and same happened to her about the same time six years ago while still resident in Abuja with their two kids, and what followed was a mental disorder leading to Mr. Ben relocating himself and his wife to his country home in Ogoja where he opted to stay in a shanty rather than his father’s house. According to Progress Oberiko, unfortunately, support is yet to come from the government who initiated their rescue.